This is the totally legal designer drug for people who've got the typography virus – which is currently spreading ... not least thanks to the worldwide success of our Typodarium typography calendar. The curious lifting of the day's page (to reveal information on the font of the day on the back) has become something of a typographical morning greeting, with real connoisseurs having several treasure chests of type specimens tucked away in their desk drawers. Each daily dose of typographic inspiration is collected, because you don't always have the immediate chance to use the typeface you've set your eye on every day. This small, fine type marvel has been given an even more elegant box this year and – more importantly – a generous splash of colour. Enjoy! 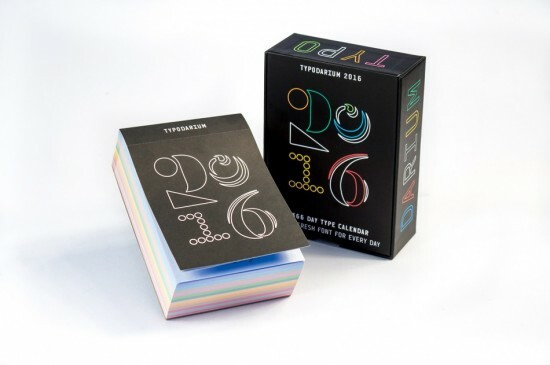 Tell your friends about Typodarium 2016! Welcome to the store of Verlag Hermann Schmidt.